This rail journey traverses Turkmenistan, Uzbekistan and Kazakhstan, travelling from the Caspian Sea to the Tien Shan mountains along the route of the ancient Silk Road. 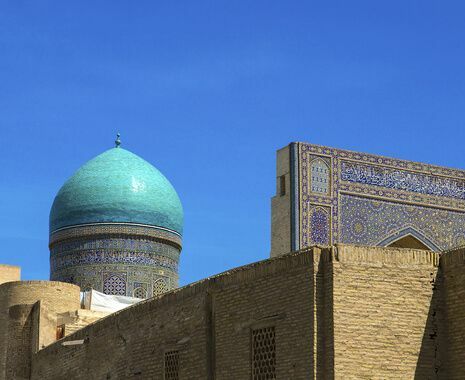 Cross windswept deserts, pass towering mountains and marvel at Central Asia’s ancient monuments. Your arrival and departure transfers may be shared with other parties and, when on board, all transfers and excursions are operated as a group with other passengers who may not be Cox & Kings clients. 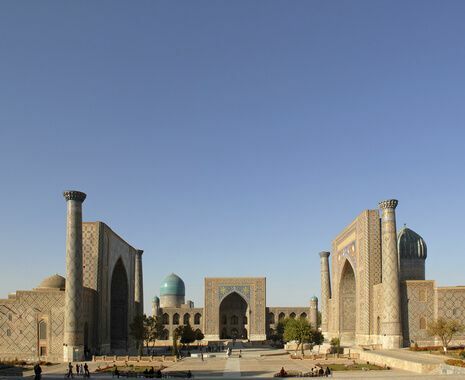 Departures are available in reverse from Ashgabat to Almaty. These depart on 8 April and 14 October 2019. "For a price quote based on alternative accommodation standards, to discuss flight options or to tailor this itinerary, please call 020 7873 5000 or enquire online." Travel in comfort aboard the Orient Silk Road Express train, which offers five cabin categories: Habibi, Ali Baba, Aladdin, Sultan and Kalif. The restaurant car serves excellent local cuisine. After dinner, the restaurant carriage offers a bar service. The train is air conditioned while moving. The Ali Baba class cabins have two comfortable lower beds and a table. Each car in the Ali Baba category has nine cabins with bathroom facilities located at both ends of each carriage. The Aladdin class cabins are the same size as the Ali Baba class however each carriage has bathroom facilities including a shower. Each carriage has eight cabins. The Kalif class cabins are larger in size and include en suite bathroom facilities including a wash basin, lavatory and shower. This category consists of only four cabins per carriage.